(TORONTO) September 9, 2011 – At the HOPE Symposium on September 17, professionals and entrepreneurs will address one of the key issues in leadership: as a leader, should you be more focused on hope or on truth? No one will suggest that leaders can avoid hard truths: some of the speakers will suggest that a focus on truth that excludes hope does not serve either organizations or individuals. All of the speakers will focus on how business leaders can develop ethical, effective influence. Gould says that she followed her dreams and wants to teach others how to do the same. Her mission is to inspire and empower others to use their natural talents to earn a living. “When you finally decide to give up the security of a regular job to start your own business, fear and excitement blend together and you feel like you’re riding a roller coaster. I want to help new entrepreneurs achieve balance and find the strength to keep moving forward through the tough times,” Gould explains. 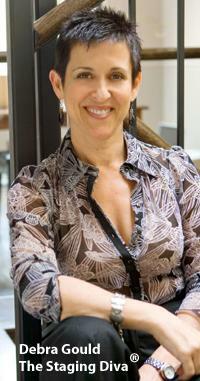 Gould is President of Six Elements Inc., an internationally recognized home staging company. Inspired by many requests from aspiring home stagers wanting to start similar businesses, Gould created the Staging Diva Home Staging Business Training Program. Since then, she has trained over 4,000 Staging Diva students worldwide to start their own businesses. All shared a natural talent for decorating and interest in real estate, but struggled with how to make money in their own home staging businesses before learning Gould’s secrets. Gould pursued an MBA in Marketing and began a corporate career before moving to advertising. In the 1980s, she launched one of the first integrated marketing firms, which she ran for 10 years. Wanting a more creative life, Debra gave up her business to design home accessories. She created the Debra Gould Home Collection, landing a magazine cover story and book feature, followed by her first of several HGTV appearances. In addition to HGTV, Debra Gould’s media coverage includes CityTV, GlobalTV, CBC, CBS Radio, CNNMoney, Wall Street Journal, Woman’s Day, Reader’s Digest, MoneySense, Entrepreneur, House and Home, Home & Decor, Style at Home, Centre of the City, USAA Magazine, FabJob Guide to Become a Home Stager, Home Style, National Post Homes, This Old House, Home Business Magazine, Globe & Mail and others. Gould will be speaking at the HOPE Symposium, which will take place on Saturday, September 17 from 9:30 am to 6:00 pm in Room 119 at the University of Toronto, Emmanuel College. Registration at the door is $80, and discounts are available for early registrations. Details are available by calling NLP Canada Training at 416-928-2394 or by visiting the HOPE Symposium website. From corporate refugee to ad agency executive, marketing consultant to artist, and home stager to author and international trainer, intrepid entrepreneur Debra Gould has stepped out of her comfort zone to reinvent herself many times on her journey as a creative entrepreneur. Gould’s HOPE Symposium presentation will inspire established business owners and those just thinking about taking steps towards making a living doing something they love.